A dental crown is a versatile dental restoration because it can be used in a variety of different ways. A dental crown can bring strength and stability to a tooth that is weakened through injury or decay. It may restore function and aesthetics to a tooth that is severely worn down. Dental crowns can be used to hold dental bridges in place. They are also instrumental in the completion of a dental implant procedure. Dental crowns are made from a variety of materials including metal, resin or porcelain. 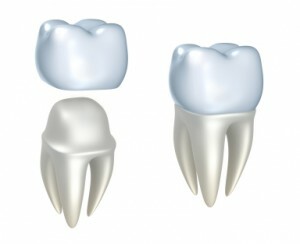 Porcelain crowns are a popular option because of their strength and durability. This material also best imitates the look and feel of your natural tooth. Typically a dental crown placement takes two trips to the dentist. Your first visit to our Nashville practice is to assess your tooth’s needs and fit you with a temporary crown, while a permanent restoration is created in a dental lab. The second visit is to fit and place the permanent dental crown. CEREC dental crowns are created with the help of advanced dental technology. 3-D scans of the tooth are taken and a restoration is created in-office while the patient waits. CEREC dental technology can help our patients receive a strong beautiful dental crown with ease and convenience in just one visit. Your Nashville cosmetic dentist will be able to work with you to find the best solution for your dental needs. Whether you need a traditional or CEREC crown, you will receive a strong, beautiful restoration when you visit Nashville Center For Aesthetic Dentistry. Call Dr. Dennis Wells today.